SET-UP Carburetor is sure the software more professional on the market to obtain the optimal calibration of the needle carburetor in the 2 stroke engine for every weather or track condition. The technical and commercial success obtained in all sectors to allow us to develop continually the software in race racing. The jetting of a carburetor, particularly in the racing field, has always been one of the most difficult stages and at the same time the most important for the the fine tuning of the engine, so is that the mechanics really good at this, have always been few, this is simply because the carburetor is very complex and over the years has complicated more and more, so it's hard to find the right solution especially in competitions where everything counts up to one thousandth !!! Always has been tried with formulas, diagrams, etc.. to give an help for jetting, but always the problems were, and still today that the formulas and diagrams have been replaced by spreadsheets, by app, etc. just look at any forum and you'll again see the same problems, this is because being a complex problem or you study it deeply, or otherwise the aid is related. NT-Project thanks to its experience thermo-fluid dynamics, has been able to study and model in detail the two aspects that determine the jetting, namely the fluid-dynamic behavior of each circuit of the carburetor, but especially the dynamic demand that the engine makes in operation. This second aspect, being difficult to analyze is almost never considered adequately, but it is fundamental to have the optimal indications for each degree of throttle opening, for all load conditions, and at each speed, because in racing isn't important to be ok only at the end of the straight, but in all the meters of the track. SET-UP Carburetor therefore has a very sophisticated technical heart ideal for all those who want to get an help in a manner professional and adequate, it is no coincidence that even good mechanical use it, but do not tell it all around!!! In a 2-stroke engine jetting plays a key role in getting the best performance from the engine, so it is important to identify the optimum jetting according the engine specifications, the driver and the characteristics of the track, and also it is crucial to be winner adapt continuously jetting according to weather conditions. SET-UP Carburetor Basic is the basic version of the Professional version and allows you to determine the optimum jetting depending on the characteristics of engine, the type of filter and the weather conditions. Calculates the effects of all the elements of calibration and shows how in every condition of throttle opening, loading and speed, your carburetor responds with respect to the optimum carburetion, thus you can act on the elements of calibration to optimize in a secure manner your jetting and always get the maximum power from your engine. When you are competing every detail is crucial and the time available to improve is always short, so in addition to the experience to have a professional instrument on your side that simplifies the work, saves time in the choices, takes you on the road immediately right, it is essential to overcome opponents. SET-UP Carburetor Professional does all this, it allows you to have complete management of the jetting, according to the engine, to its level of tuning, his setting of ignition, compression, timing, type of filter, the driving style of the driver, to the characteristics of the track, the vehicle's weight, and obviously as a function of atmospheric conditions. Also allows you to compare two calibration, allows you to take as a reference its own jetting and adjust it to new conditions, and especially will automatically calculate a series of settings that optimize the jetting by varying the main elements of calibration. Since that in the competition research to improve is limitless, NT-Project has created a version just for those who in addition to optimizing their material is looking for new solutions that can possibly add something to the development and performance. Often happened to see in the most prestigious races, then with the better for everyone, from the engines, the tuners, the mechanics, the driver, etc., that between two calibration both optimal, one gave a little more, and the most obvious explanation is that the jetting married better with the style of the driver or of the characteristics of the track, and this is very true, but beyond that there are also technical reasons that distinguish the settings and the fact of providing an optimal carburetion. NT-Project thanks to its technology thermo-fluid dynamics has deepened this aspect and identified two other aspects which distinguish the calibration, the response time, and the fuel emulsion that each calibration is able to provide. 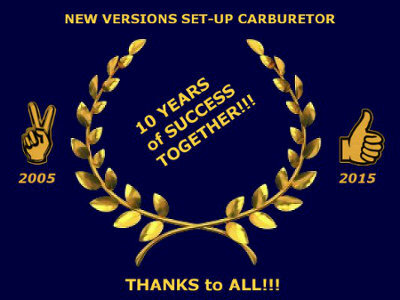 SET-UP Carburetor Experience then added to all that you have seen in the Professional version, the computation of these two quantities allowing you to find the best of the best solution to suit your needs. The choice of the coupling needle - atomizer is one of the most important things to have optimum operation of the carburetor according to the characteristics of the engine, the driving style of the driver and the characteristics of the track, for this NT-Project has made Carburetor Analysis allowing you to analyze the behavior of each coupling needle - atomizer and moreover automatically find which needle allows to satisfy your needs for carburetion to different throttle openings. It also makes one thing unique, and namely it calculates how you must readjust the main jet when changing type of needle and atomizer. In fact, each needle and each atomizer determine a different fluid loss in the circuit of the maximum, therefore, to have the same fuel mixture at full load is required a specific main jet. The software can be used on any computer with Windows operating system. It 'was designed to be used on screens with minimum resolution 800 x 600 pixels, so it can be easily used even on small notebook or netbook. NT-Project follows you at all stages, from installation, to the early stages of use, both to give you advice on the operation, and to give you guidance as to the most suitable settings for your case, so as to allow you to take full advantage of the high potential of the software. The license to use the software allows 2 installations, furthermore in case of computer failure it's possible a re-installation within 24 months.